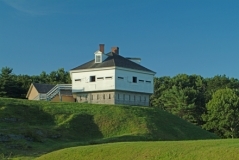 Fort McClary, Kittery Point, Maine; Blockhouse (1844), Guarding the entrance of the Piscataqua River on the Maine shore. 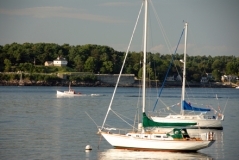 View of Newcastle, New Hampshire from Fort McClary, Kittery Point, Maine; Showing lighthouse, coast guard station and Fort Constitution (Fort William and Mary in colonial times). 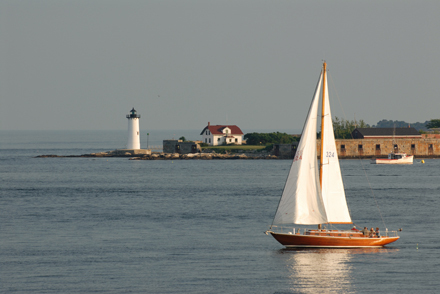 Sloop (sailboat) in foreground. View of Fort McClary, Kittery Point, Maine from Newcastle, New Hampshire; Sailboats at mooring in foreground; Lobster boat in background. 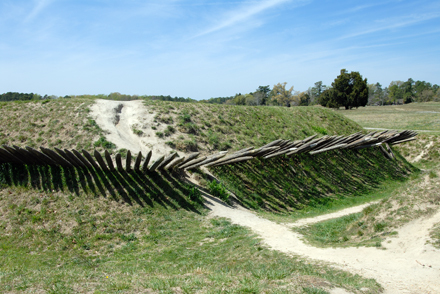 Yorktown Battlefield, Yorktown, Virginia; Redoubt No. 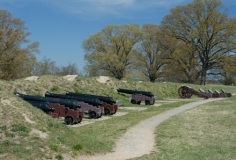 9 with chevaux de frise. Yorktown Battlefield, Yorktown, Virginia; Grand American Battery cannon and berm. 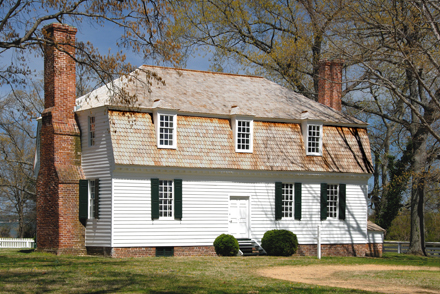 Yorktown Battlefield, Yorktown, Virginia; Moore House - site of surrender negotiations 1781.